Soft, but not too doughy, vegan cinnamon rolls with a cinnamon sugar crunch bottom. 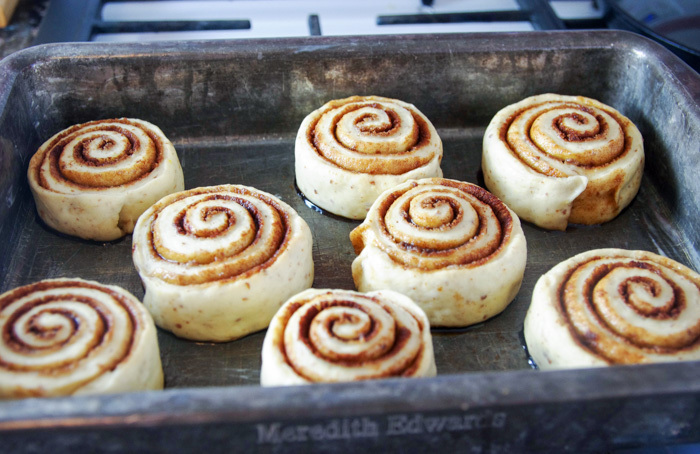 Make two pans of cinnamon rolls in less than two hours from start to finish! 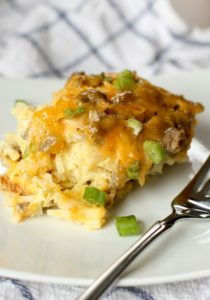 If you need to, you can make them ahead to bake on a busy morning. I’ve made vegan cinnamon rolls before I’ve made regular ones. 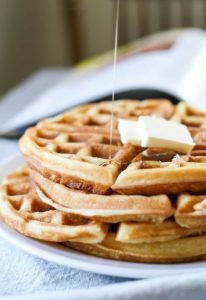 We have two children with severe food allergies, so serving up yummy breakfast without milk and eggs became the normal in our home. 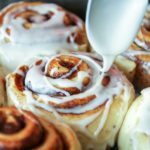 I came across a vegan cinnamon roll recipe years ago made with ground flax seed. I not only love the hearty look of flax in baked goods, but also its nutty flavor! 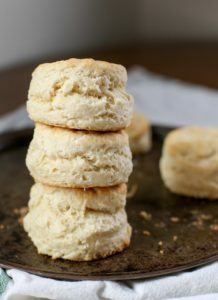 Over time, I’ve changed the recipe up a bit, but it still stands to be one of our family favorites. These rolls are soft, but not too doughy. 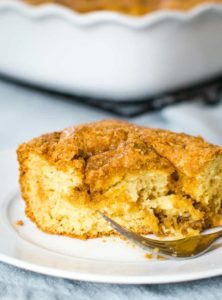 The filling consists of vegan butter and a good helping of dark brown sugar for deeper flavor…and when they come out of the oven, the bottom edges will have these little bits of crunchy cinnamony sugar, which is just how we like ’em! My friends, they are DELICIOUS! 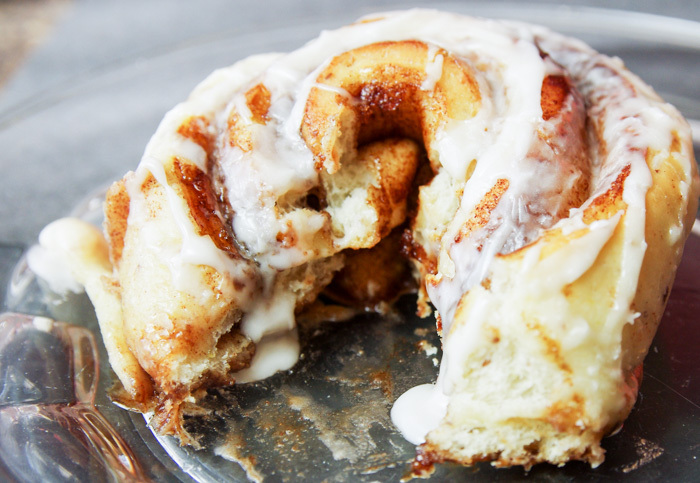 With only a handful of ingredients, I can make two pans of cinnamon rolls in less than two hours from start to finish…and that includes an hour of rising! I either make them to be baked that day or freeze them unbaked for some time in the future. 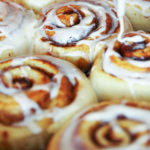 Try turning a Saturday morning into a memorable one with fresh baked cinnamon rolls you prepared months ago! 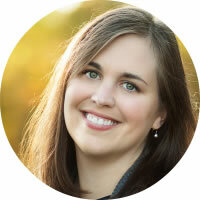 Your kids will think you’re a rock star. Holidays are also a great time for made-ahead rolls. We always serve them on Christmas morning with bacon and coffee 🙂 I think even when my kids outgrow their food allergies, I’ll still be making these vegan cinnamon rolls. 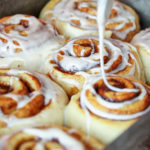 Are you ready to make vegan cinnamon rolls with me? 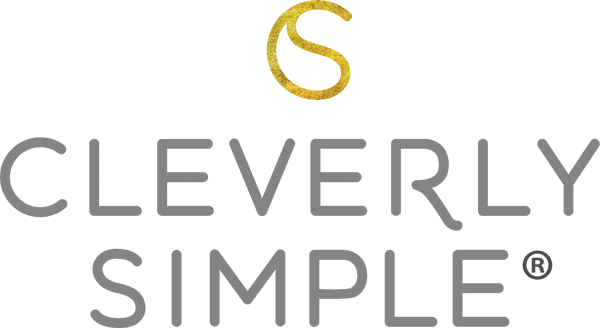 The first step is to combine 2 Tablespoons of ground flax seed with 6 Tablespoons of water and allow it to work its magic. “Flax eggs” have the same consistency as regular eggs and also provide omega 3 health benefits.. 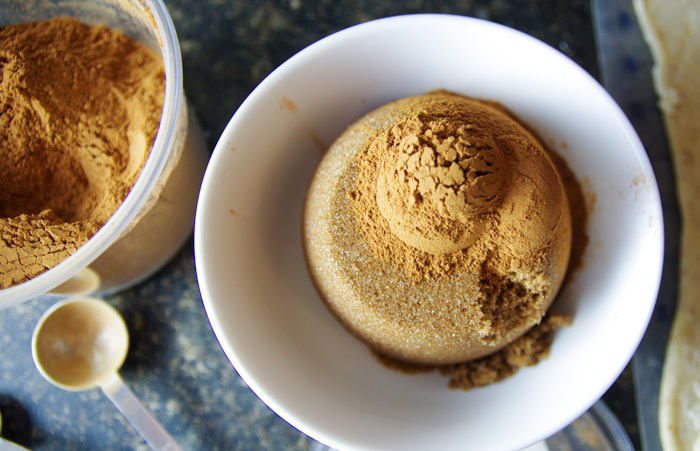 In your mixer bowl, combine 2 1/2 teaspoons of yeast with 1 cup + 2 Tablespoons of warm water. Using a dough hook, mix the yeast and water together and let it stand for 10 minutes. Meanwhile, let’s get our flavor enhancers ready to go! You will need 1/2 cup granulated sugar, 1/3 cup melted vegan butter and 1 tsp. salt. You can also make this dough with melted coconut oil instead of vegan butter. If you choose to do that, add an additional 1/4 tsp. of salt. Get your flour ready too. You will need 4 1/2 cups of all-purpose flour. 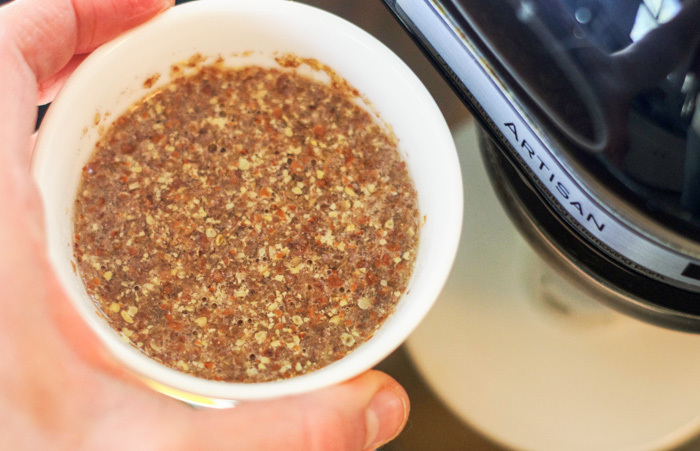 To your yeast/water, mix in the sugar, melted butter, salt and bowl of flax eggs. Do you see how the flax seed really absorbed the water? It will be goopy just like real eggs. With the mixer at low speed, slowly add all of your flour until it is completely incorporated and all of the dough sticks to the hook. This will only take a minute or two. 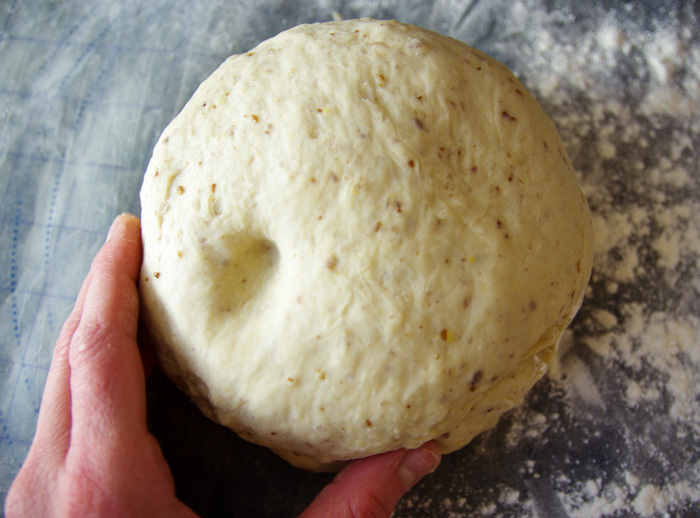 On a lightly floured surface, knead the dough ball with your hands until it is no longer sticky. 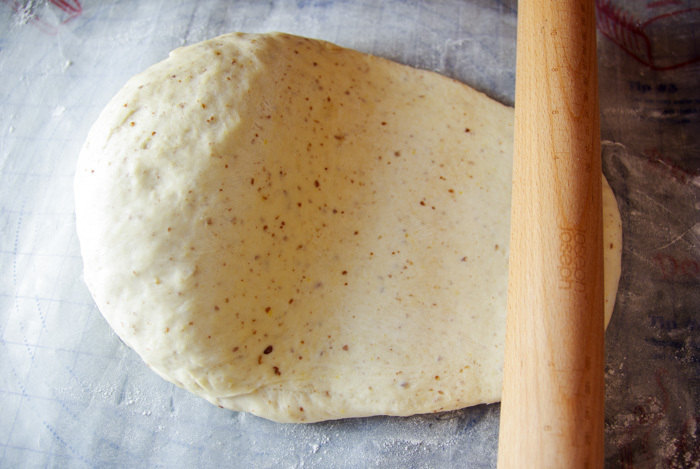 The dough is ready for rising when you can make an indentation into the dough as pictured here. It will only take a couple minutes of kneading. This dough is really great to work with! Set the dough back into the mixer bowl, cover it with a towel, and set it near a warm spot for one hour. I like to turn my oven on and set the bowl on top of the oven, but a heat register or warm windowsill would work just as well. After one hour, the dough will be ready! Next, roll the dough into a 20×16 inch rectangle. Have I already said how much I love this dough? It stretches really easy so you can save your muscles for the gym! Using a plastic baggie to cover your hand, coat the entire rectangle with 1/2 cup of soft vegan butter. You will feel like you’re back in preschool when you painted pictures with pudding….Anyone? In a smaller bowl, mix together 1 1/2 Tablespoons cinnamon and 1 cup packed dark brown sugar. Many recipes call for granulated sugar in the filling, but I prefer the hint of molasses from dark brown. It has a richer taste that goes really well with our dough. Sprinkle all of the cinnamon and sugar mixture over the butter (we are generous here!) Then, with clean hands, roll the dough up from the long side, pinching the seam closed at the end. With a serrated knife, gently slice your role every 1 1/2 inches and place the rolls flat side down onto two greased 13×9 pans. I typically get 15-16 rolls out of this recipe, so I will split them up between each pan. A little tip is to use aluminum or coated pans. I have found that glass pans will cook the bottom of the rolls too quickly. If you’d like to bake them right away, place pans on top of your oven and then turn the oven on to 375 degrees. While the oven heats up, your rolls will rise a bit more. If you DO want to freeze the unbaked rolls, cover them with plastic wrap, followed by foil and the lid. Take them out the night before you want to bake them and set them on the counter (still covered). They will be perfectly ready for the oven when you wake up! 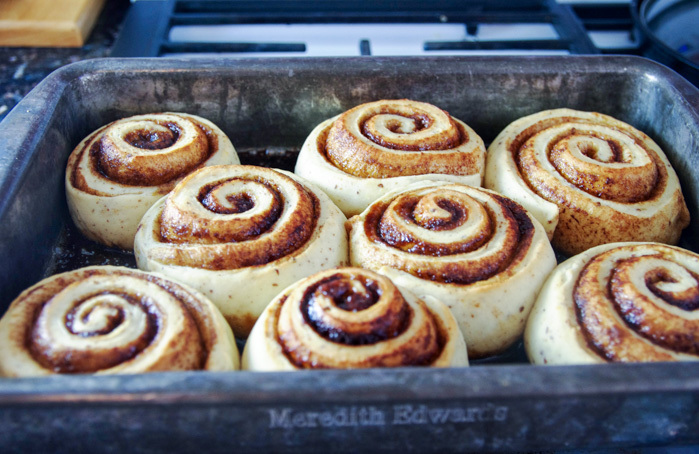 Bake the cinnamon rolls for 15-20 minutes or until slightly golden on the edges as seen here. I just like it fast. On the roll. Grab a fork. Now. Yum. Yum. Yum. Soft vegan cinnamon roll with a crunchy cinnamon sugar bottom. Topped with a sweet icing. Best served warm! 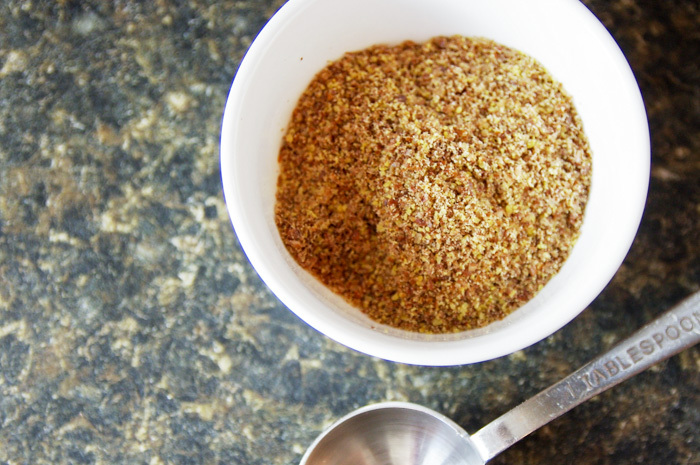 Combine 2 Tablespoons of ground flax seed with 6 Tablespoons of water and set aside. 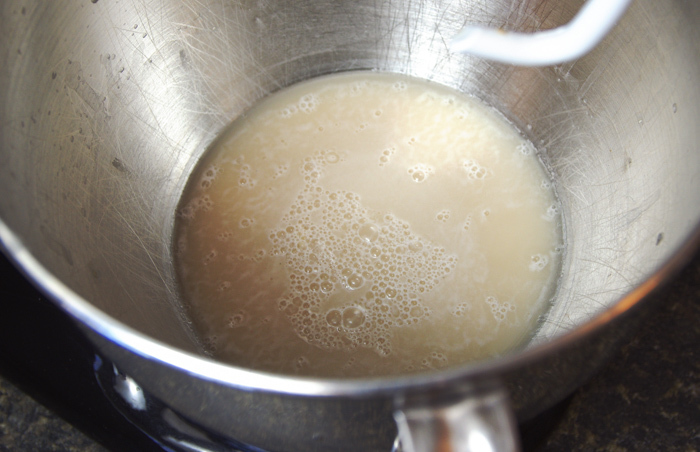 In your mixer bowl, combine 2 1/2 teaspoons of yeast with 1 cup + 2 Tablespoons of warm water. 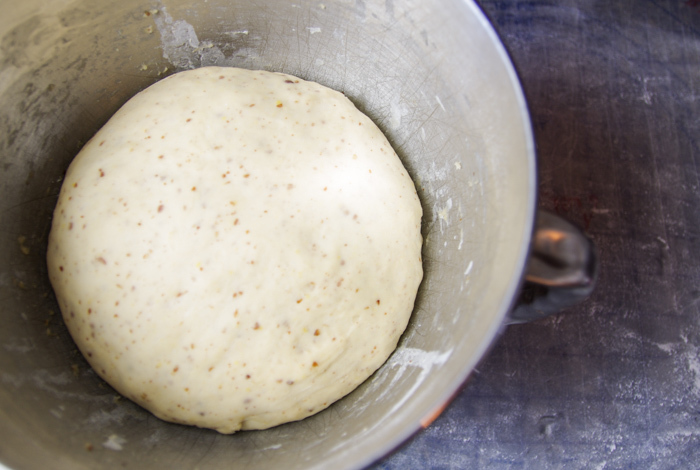 Using a dough hook, mix the yeast and water together and let it stand for 5 minutes. Mix in 1/2 cup granulated sugar, 1/3 cup melted vegan butter, 1 tsp. salt and your flax egg to the water/yeast. 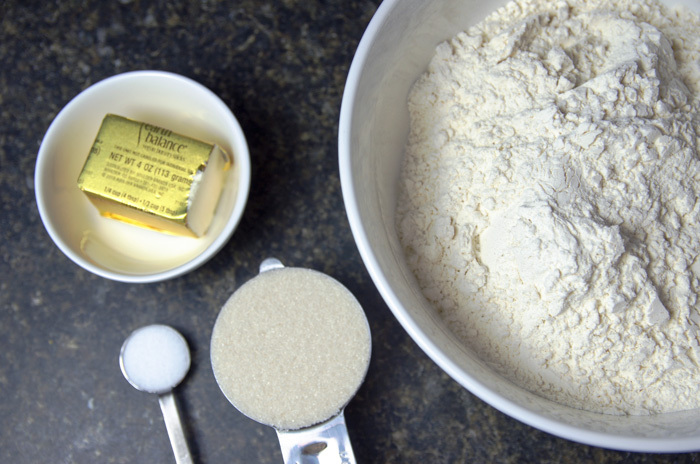 At low speed, slowly add 4 1/2 cups of all purpose flour until all of the dough sticks to the hook. 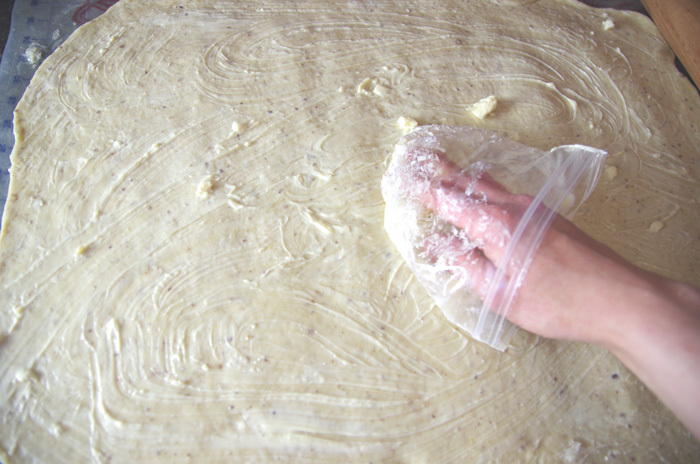 On a lightly floured surface, knead the dough ball with your hands until it is no longer sticky and you can make an indentation into the dough with your finger. Set the dough back into the mixer bowl, cover it with a towel, and set it near a warm spot for one hour. 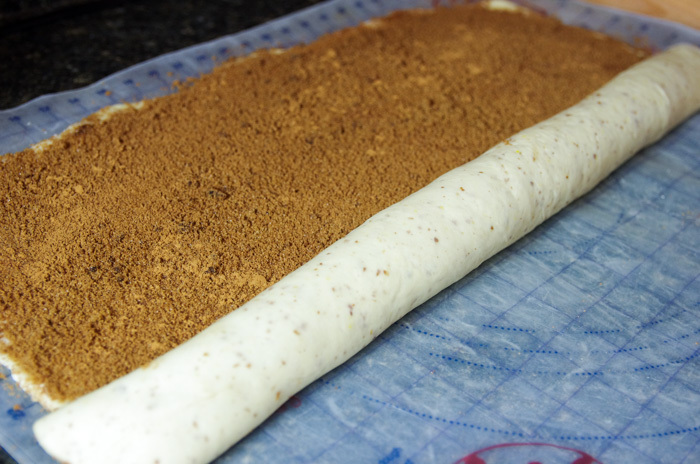 Next, roll the dough into a 20×16 inch rectangle. With a baggie on your hand, spread 1/2 soft vegan butter all over the dough, followed by a sprinkling of 1 cup dark brown sugar and 1 1/2 T. cinnamon. 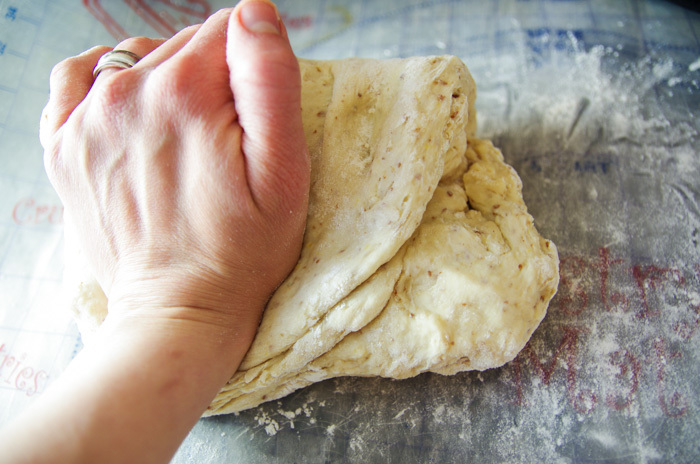 Using clean hands, roll the dough all the way up from the long side and pinch the seam closed. With a serrated knife, gently slice your role every 1 1/2 inches and place the rolls flat side down onto two greased 13×9 pans. To bake right away, set the rolls on top of the oven and turn the oven on to 375 degrees to allow the rolls to rise a bit more. Bake the rolls for 15-20 minutes or until the edges are slightly golden. 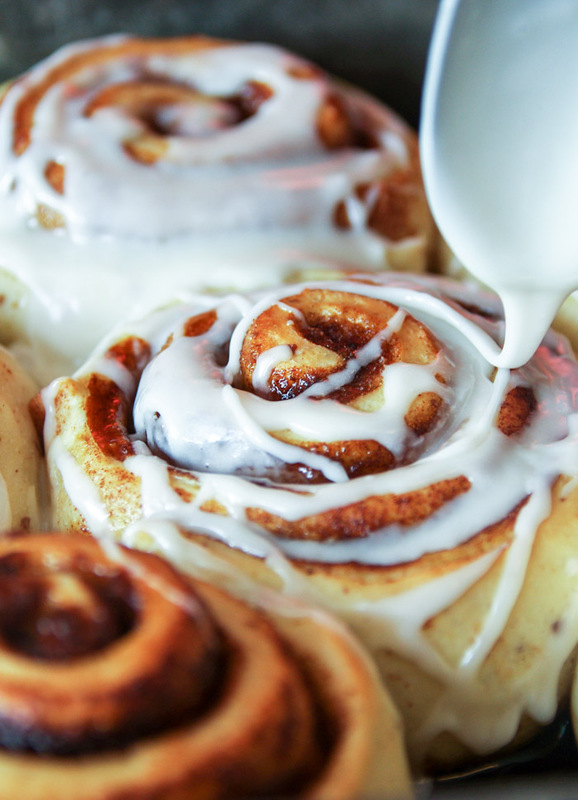 Drizzle hot rolls with icing. 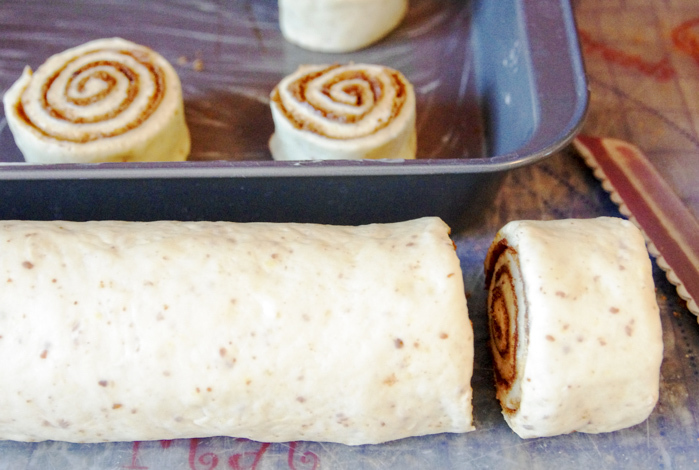 Want to make-ahead the vegan cinnamon rolls? Cover the unbaked rolls with plastic wrap, followed by foil and the lid and freeze. Take them out of the freezer the night before and set them on the counter (still covered). 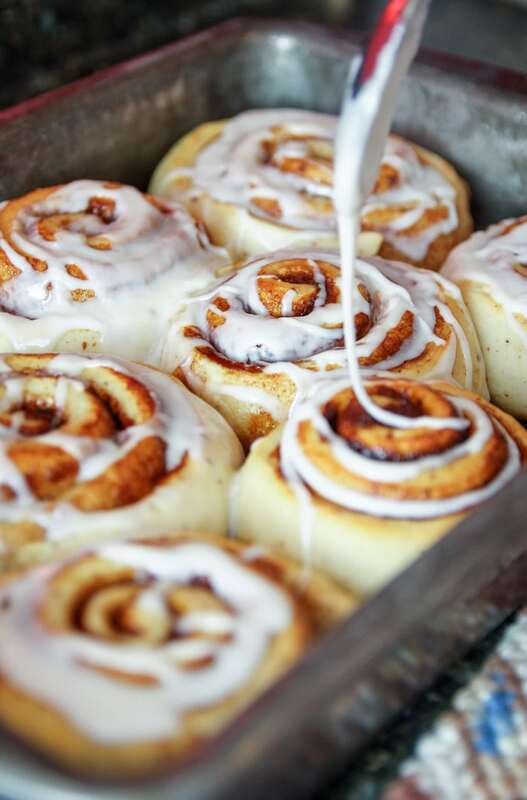 They will be ready to bake when you wake up. Following the baking instructions above.